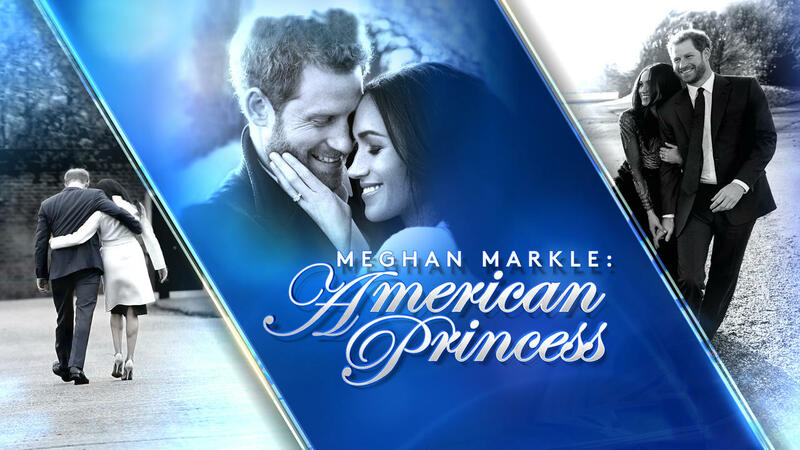 "Meghan Markle: American Princess," a CBS News special anchored by "CBS This Morning" co-host Gayle King, explores the life of Markle, the future wife of Prince Harry. The two married on May 19, 2018. "Meghan Markle: American Princess" is an engaging, inspiring look at the extraordinary woman who first stood out as a grade school student because of her passionate efforts to right wrongs. She went on to become a successful actress and then one-half of a global power couple for a new era. Her story is told through intimate, revealing interviews with the people who know her best -- sorority sisters, high school teachers, fellow actors from the TV series "Suits," and more. CBS News royal contributor Tina Brown and royal experts weigh in on the couple, their upcoming marriage, and what their fairy-tale relationship means for the British monarchy and the world. "These two are going to be the premier global philanthropists in the world," says Brown. "They're just a young couple in love," says photographer Alexi Lubomirski, who was commissioned by the royal family to . "It's the most beautiful thing to see. And I'm a cheeseball so I love that kind of stuff." In his only U.S. television network interview, Lubomirski tells King he and the couple shared their passions for humanitarian work and Botswana, where he grew up. Actor Wendell Pierce, who played Markle's father on "Suits," reveals what he told Markle when he heard the news she was engaged. "I said, 'I just want you to know. I know all the stuff that's gonna happen to you. And it's gonna be crazy. Just in a quiet moment, just know, I'll always be your friend. There's someone thinking about your best interests. And we care about you,'" Pierce says. Prince Harry and Meghan Markle have captured the attention of the world in recent months, but friends and others, including corporate giant Procter & Gamble, knew of Markle long before. For example, when she was just 12, Markle took issue with a P&G commercial for dishwashing liquid that struck her as sexist, and she wrote the company. She also wrote to Linda Ellerbee, then the executive producer and anchor of "Nick News," on Nickelodeon. Ellerbee profiled young Markle. The company changed its marketing. "I knew after that story that this little girl wasn't going to change," Ellerbee says. "That she was going to change her world." Christine Knudsen, a teacher at Immaculate Heart High School in Los Angeles, saw that same determination in young Markle. "She didn't see things as roadblocks – and I think she loved to rise to challenges," Knudsen says. "And, OK, this door is closed. Let's find a window." "I just always remember saying that she, like, looked like a princess, I don't know how else to describe it," says Northwestern University sorority sister Erica Bethe Levin. "She just radiates like, this, ridiculous aura." "Meghan Markle: American Princess" looks insode couple's courtship and through preparations for the wedding on May 19, 2018, including a look at the famed St. George's Chapel at Windsor Castle, where the couple will be married. The special also explores how Markle, who is biracial and divorced, helps advance the monarchy in today's world. "Everything that could have gotten you beheaded 500 years ago, that's why this engagement, this marriage, has already brought the monarchy well into the 21st century," says Vanity Fair writer Sam Kashner, who wrote the first major profile of Markle for the cover of the magazine. CBS News will have full coverage of the royal wedding on May 19, starting at 4 a.m. ET, anchored by Gayle King and "Entertainment Tonight's" Kevin Frazier. CBS News will also present "Royal Romance: The Marriage of Prince Harry and Meghan Markle," a two-hour special to air May 19 at 8 p.m. ET/PT.